Josh Douglas saw his hopes of making the Forrest Wood Cup dashed because of an error he made purchasing the proper fishing license for the Lake St. Clair FLW Tour in late June. Josh Douglas thought nothing of it as he watched the center console bay boat bearing the insignia of the Ontario Ministry of Natural Resources and Forestry make its way through a gaggle of 15 to 20 boats fishing on the Ontario side of Lake St. Clair on a Friday back in late June. The officers on board were out doing random safety and license checks. Nothing out of the ordinary. It was day 2 of the Lake St. Clair FLW Tour and Douglas already had a limit for 20-plus pounds in his livewell. Coupled with the 17-12 he caught the previous day, it was likely enough to earn him a paycheck and, more importantly, keep him inside the points cutoff for the Forrest Wood Cup. Things were going good for Douglas, who�d finished a career-high 3rd at the Kentucky Lake FLW Tour back in mid-May. Douglas was off a ways from the group of boats, but he figured he�d be next to get checked. Sure enough, the boat headed his way. As the officers approached, Douglas retrieved his phone and attempted to pull up a digital version of his license, which was saved in an online cloud storage. However, since he was outside the range of U.S. cell service, he was unable to access it. Since Ontario requires anglers to possess an Outdoors Card in order to purchase a fishing or hunting license, the officers relayed the information off of Douglas� Outdoors Card to dispatch in order to confirm his license status. As the boats bobbed in the waves, the radio transmission from dispatch sounded like good news to Douglas. �Mr. Douglas is good with a conservation license until July 1st,� the voice said. The officers looked at each other awkwardly, Douglas recalled. �We have a problem,� one of them said to Douglas. �No, I�m good through July 1st,� he replied, citing the dispatcher�s findings. The officer then explained that Douglas had purchased an 8-day non-resident conservation fishing license, which entitles him to have no more than two bass in his possession. He should�ve purchased the sport fishing version, which would�ve covered him for the purposes of competing in the tournament. Upon releasing his fish, Douglas motored back to U.S. waters and contacted FLW Tour tournament director Bill Taylor. After advising Taylor of his situation, Douglas returned to the Lake St. Clair Metropark, the official launch facility for the event, where he had to release his remaining two fish for being in violation of FLW rules regarding proper licensing. When Douglas informed Taylor that he�d also made every cast on day 1 in Canadian waters, his day-1 weight was wiped out, too. With less than an hour left to fish, Douglas floated around near Lake St. Clair Metropark, trying to make sense of what had just happened. He hadn�t practiced at all on that side of the lake and wasn�t able to muster another bite, leaving him with two zeroes by his name on the leaderboard. His Cup hopes were history. The whole scene was a blur, he said. Word of his situation began to spread through the field as other anglers began to check in prior to weighing their catches. He received a lot of support and pats on the back from his competitors, but the gravity of it all didn�t start to sink in until he pulled the door shut on his truck as he readied to leave the launch ramp. �That�s when it first hit me,� he said. �I was mad that it happened, but I look up to guys like Greg Hackney. He�s one of the best dudes out there. He�s been DQ�d before for making a cast in an off-limits area. Brandon Palaniuk. He got DQ�d for a culling mistake that cost him $100,000. Aaron Martens had those bolts sheer off on his jack plate or else he�d have won (in 2013). It�s what happens in our sport. You can do everything right, but you have to cross all the T�s and dot all the I�s. Douglas� misfortune not only derailed what had the makings of another solid tournament, it submarined his bid to qualify for his first Cup. While acknowledging the error was totally his fault, he wants to use his experience to educate other anglers and stress the importance of understanding the licensing requirements for non-resident anglers, especially along border waters and for lakes in Canada that attract U.S. anglers for fun-fishing trips. After the Kentucky Lake Tour stop, Douglas and his wife, Bri, headed straight to Lake St. Clair to get in some scouting. Despite living in Minnesota and fishing smallmouth all across the upper Midwest and northeast, Douglas had never been to St. Clair. When he got there, he did no fishing. It was a idling/graphing trip and to get a feel for what was in store when he came back. After leaving St. Clair and heading back to Minnesota � the Douglases live on Mille Lacs Lake, where Josh guides in between tournaments � he made a point to update his Ontario Outdoors Card and to pre-purchase his license for the tournament week. �It knew it�d been a few years since I fished a B.A.S.S. Open so I knew I needed to update my Outdoors Card,� he said. With Josh behind the wheel and Bri working the laptop, they pulled up the Ontario license options online. And that was the last time he thought about it until six weeks later. Pro bass anglers learn hard lessons all the time on the water and Douglas� situation is no exception. He took ownership of the mistake and vowed not to let it define him. He said if anything comes out of this, he hopes it helps other anglers realize the importance of even the smallest detail, even if it is about the type of license or duration of time it�s valid for. He also thinks it might be helpful at future tournaments staged at venues where international borders are in play that tournament officials be more pro-active in ensuring competitors are properly licensed prior to the start of the event. 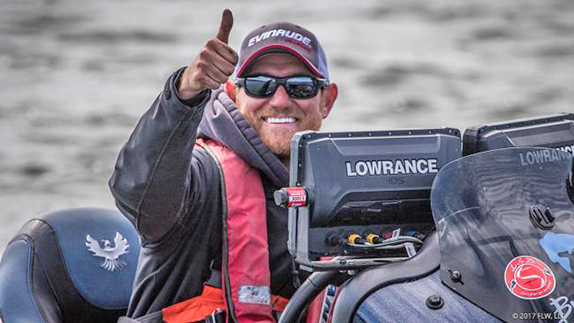 According to FLW, Taylor reminds anglers at the pre-tournament briefing to have a proper and valid license and he also conducts random license checks at each Tour event. If an angler is unable to provide proof of a valid license within a reasonable amount of time from the request, a disqualification will be entered for that day and any preceding days for which was license was required. With several borders coming into play at Lake St. Clair, there were up to four license options for the St. Clair Tour event and as much was spelled out on the tournament landing page on FLW�s website. Obviously, a Michigan license was needed for Michigan waters. An Ontario Outdoors Card and license were needed for Ontario waters. In addition, for those running to the Ohio side of Lake Erie an Ohio license was needed and a special license was also needed for Walpole Indian Reservation on the northwest side of St. Clair. �People deserve to be DQ�d and in that case I deserved a DQ,� Douglas said. �FLW didn�t want it to happen. The Ontario government didn�t want to happen and I sure didn�t want it to happen. It cost me a whole lot � likely a paycheck at that tournament and making the Cup, which would�ve been another $10,000 minimum. Being in my second year, making the Cup would�ve been huge for me.